Just what is a docent and what do they do? 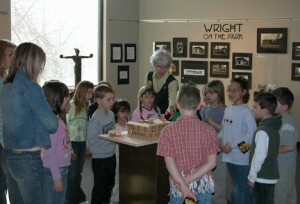 A docent is a trained volunteer educator who guides children or adults through a museum. The Latin word, “docere” from which docent is derived, means “to teach”. The Charles H. MacNider Art Museum has a lively and informed group of docents who enhance our mission of engaging diverse audiences in the enjoyment and understanding of the visual arts. We would like to invite YOU to consider joining them. As a docent you will explore ways to look at a work of art, the principles of art and elements of design, an overview of American art history and touring techniques. and continues every other Wednesday through April 3. Then share your knowledge as soon as the spring tour season begins! The Charles H. MacNider Art Museum is always happy to welcome new members to the dedicated group of docents who currently give tours to school and community groups. Docenting is a great way to stimulate your mind, meet new people, give to the community, and just have a good time. Our current corps of docents are a lively and interesting group of men and women who do just that! An art background is not required, only a desire to learn about our collection of American art and an interest in sharing your knowledge with the public. Call the Director, at 641-421-3666 for more information or e-mail Edith Blanchard.